Have your adventurous hound and ready to enjoy the winter in the Hurtta Extreme Warmer Dog Coat - Lingon! The Extreme Warmer provides versatile protection and is designed to provide efficient warmth for both extended outdoor activities in cold conditions and during training or competition. The Extreme Warmer will keep your dog warm in demanding conditions. It is also particularly well suited to outdoor activities in winter, when long-term exposure to cold cannot be avoided. 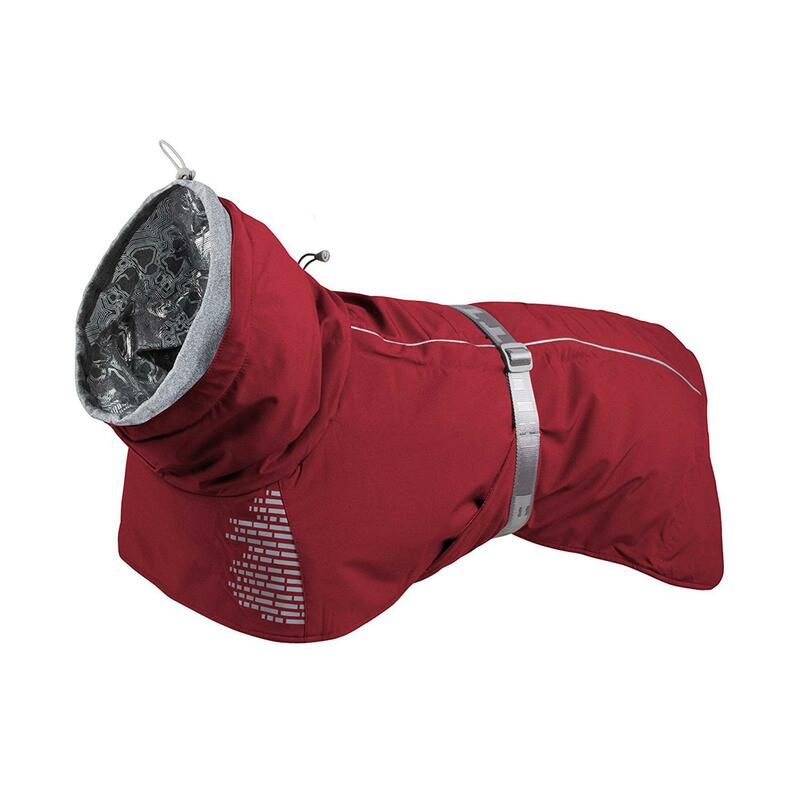 The unique lining material of the Extreme Warmer reflects the dog’s heat and thus stimulates its blood circulation efficiently unlike a regular winter jacket. This will help the dog’s muscles stay warm and prevent injuries during active dog sports. The surface material of the product is laminated with a waterproof and breathable film. Reflector piping seams on the back of the jacket and the seams on the rear section are taped. The lining fabric is smooth polyester fabric that will not tangle the dog's fur. Besides a high collar, the jacket has a warming tricot hood that can be lifted to protect the dog’s ears and head. The jacket protects the most important muscle groups for the dog’s heat production as well as its neck and chest. Soft and slightly flexible material is comfortable to wear and allows complete freedom of movement. The bottom section of the jacket is dimensioned to cover the abdominal area that is sensitive to cold. With adjustable back length, collar and waist, and a protective rear hem, this highly technical outfit is suitable for a range of applications. The back of the product has a leash opening for collar or harness attachment size 12 and up. The smaller jacket has a ring for fastening a leash. The jacket’s efficient 3M reflectors improve the dog’s visibility in the dark. Size 10": Chest 14-16" Neck 14" Length 10"
Size 12": Chest 18-22" Neck 17" Length 12"
Size 14": Chest 20-24" Neck 20" Length 14"
Size 16": Chest 22-28" Neck 20" Length 16"
Size 18": Chest 28-32" Neck 23" Length 18"
Size 20": Chest 28-32" Neck 24" Length 20"
Size 22": Chest 28-32" Neck 27" Length 22"
Size 24": Chest 30-33" Neck 28" Length 24"
Size 26": Chest 32-37" Neck 29" Length 26"
Awesome website. Super fast delivery!